Healthy, glowing skin is as much a product of the right combination of creams, serums and cleansers as it is of environmental factors and the choices you make every day. Keeping certain habits in mind can help you avoid the pitfalls of unhealthy skin and gain the maximum potential from your products. Here are 5 to consider! Like our gym clothes and bed sheets, pillowcases can accumulate bacteria, dirt and oil from our environment, skin and hair. After some time, the buildup of dirt and oils is transferred from the pillowcase back into your skin which can clog pores and cause blemishes. You might be surprised to learn this, but there’s actually a name for this type of acne, acne mechanica, which refers to all acne caused from foreign materials touching your skin. To be on the safe side, wash and replace your pillowcases about once a week (if not more frequently). Another easy solution is to make sure to wash your face every night and remove styling products from your hair (yes, the products from your hair are absorbed as well, and can cause breakouts), especially makeup. Non-comedogenic makeup wipes are perfect for a quick and easy removal! Another little trick is to use a silk or satin pillowcase, which causes much less friction than cotton. Plus, because silk and satin don’t tug at your skin or absorb moisture, they can actually help prevent visible signs of aging like the appearance of wrinkles (not to mention you’ll feel all the more luxurious)! 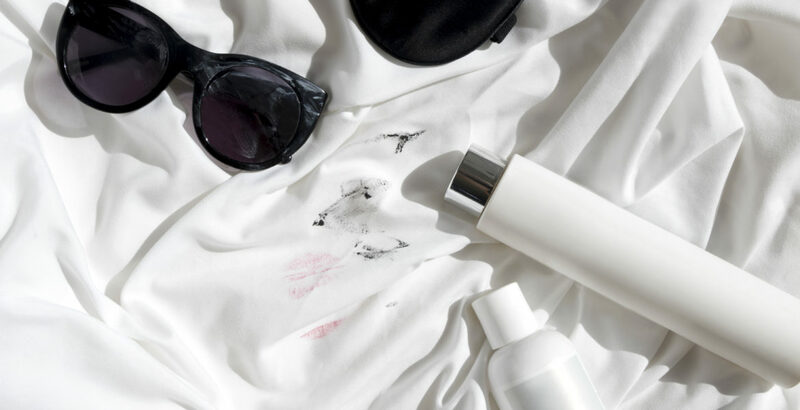 While it’s not uncommon to think “the more the merrier,” when it comes to skincare products, there’s a fine line between just enough and way too much. There’s definitely a temptation to layer product after product, especially when each one has a different active ingredient to target a different concern of yours. However, there can be problems when active ingredients counteract against each other or when they are not absorbed properly and clog pores. In this day and age, products are more effective than ever and many products contain a variety of actives in a variety of doses. So what can you do? Begin by looking at the actives in your current products and make sure you’re not overloading your skin with an active which can cause irritation. For example, if you use a lot of products with salicylic acid, your skin can experience some irritation because salicylic acid is meant to be used in small quantities. Make sure you understand just what role the actives in your products play — the stronger the ingredient, the less you’ll need. You might be a bit puzzled by this category, but just hang tight! It’s unfortunately very possible that your shampoo could be leading to breakouts on your face, shoulders, or back by leaving residue on your skin which can clog pores and induce visible issues. Generally, this is a trend that varies from person to person — what might cause acne on your back is just fine for your friends. But if you find yourself with unexplainable acne on your back, try experimenting with a few different shampoos. Another good idea is to wash and condition your hair before washing your face and body. This can help remove any residue left behind. It’s easy to remember your sunscreen in the heat of summer and even easier to forget your sunscreen in the chill of winter. But did you know that even with cloud cover, UV rays can still penetrate your skin and cause damage? Many people that believe that clouds filter UV rays, but the truth is, the only filter out sunlight. This leaves you exposed to harsh UV rays. There is also an added risk in winter — snow. Snow can actually reflect UV rays, which can increase your exposure. A good rule of thumb is to always wear sunscreen, and if you’re planning on hitting the slopes, bundle up! One of the most challenging things about acne is how just about anything can cause it — even your sunglasses. It might sound a bit odd, but when you get down the logic of it, it actually begins to make sense. Sunglasses rest on your skin, and cause friction with their slight movements. Plus, during the summer, you sweat all over — including your face. Oils, bacteria, and other debris are trapped in place by the parts of your frame that touch your skin. Add sweat to this mixture and there is a recipe for clogged pores and acne. This is another type of acne mechanica, which is acne caused by pressure and friction. Thankfully, wiping down your frames daily will help take care of this pesky problem.